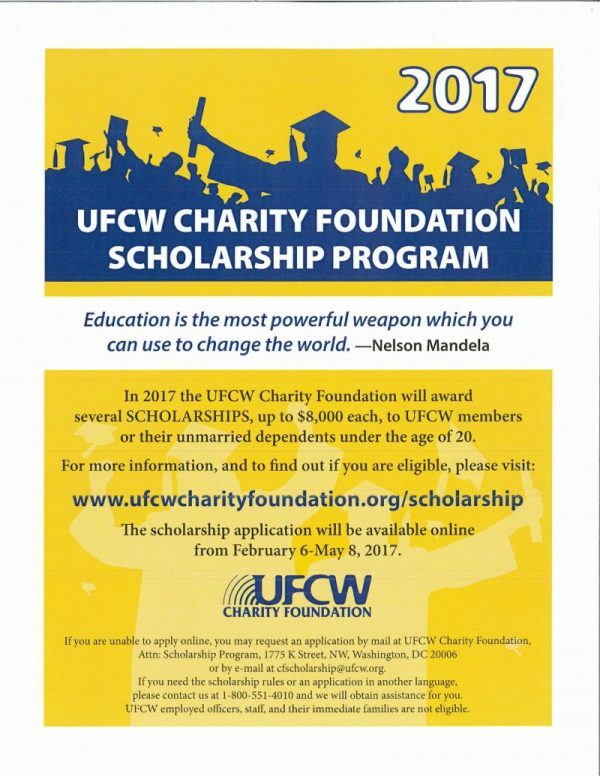 The scholarships are limited to any UFCW member who has been active since January 1, 2016. The children and/or dependents of active members are also eligible to apply if they are unmarried and under the age of 20 on May 31, 2017. The scholarship recipients will be selected and awards made on the basis of several factors including scholastic achievements, community involvement and an essay which shows an understanding of the principles of the labor movement. The UFCW Charity Foundation Scholarship Application Form is completed when the scholarship committee receives your Official Grades Transcript and Part B Form (which is provided after you complete the application online). Both must be mailed with a postmark date no later than May 22, 2017. Keep in mind the time frame needed to receive the information from your school. 1. Read the Procedures thoroughly. information about you as well as verify that the information you provided is true. It will also allow your local union to release your membership information to the UFCW Charity Foundation for the purposes of verifying your eligibility. 4. Give the application to your academic counselor who will complete it and mail it along with your grade transcript as well as proof of graduation, intent to graduate or receive your GED. 5. Please do not submit any material other than requested. college or university that the student is or will be attending, and the recipient must be registered in such school as a non-probationary student. • The recipient must agree to maintain a satisfactory grade level and will forward to the UFCW Charity Foundation either a copy of his or her grades each quarter or semester, whichever is applicable, or a transcript of grades for the year at the end of each school year. • Payment of the benefits to scholarship recipients may be temporarily suspended upon written request of the winner under certain circumstances. • In the event that the recipient’s education should be interrupted for some reason, he or she must notify the UFCW Charity Foundation in writing of such expected interruption and advise the UFCW Charity Foundation as to the cause for the interruption and the estimated date upon which the recipient expects to resume their studies. scholarship is to be continued or deferred for any period of time. application in another language, please call 800-551-4010 and we will obtain assistance for you. • Only Scholarship recipients will be notified via mail. • Recipients’ names will be posted on the UFCW Charity Foundation Website. 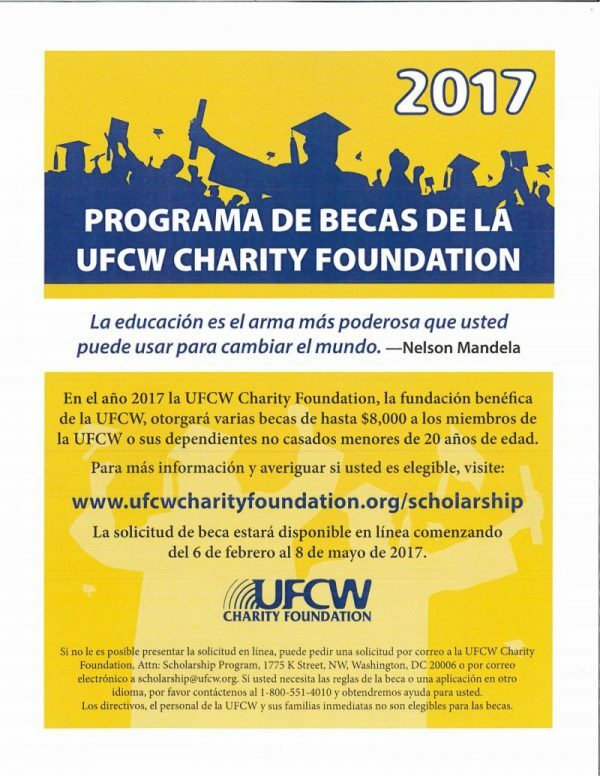 • Email cfscholarship@ufcw.org with questions.